It is early spring and the time most of the bugs come out. 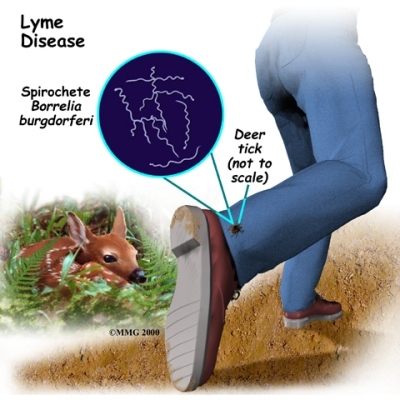 Which along with them comes bacteria Borrelia burgdorferi, which causes Lyme disease. What are the symptoms of Lyme disease ? Lyme disease affects different areas of the body in varying degrees as it progresses. The site where the tick bites the body is where the bacteria enter through the skin. As the bacteria spread in the skin away from the initial tick bite, the infection causes an expanding reddish rash that is often associated with “flu-like” symptoms. Later, it can produce abnormalities in the joints, heart, and nervous system. In the early phase of the illness, within days to weeks of the tick bite, the skin around the bite develops an expanding ring of unraised redness. There may be an outer ring of brighter redness and a central area of clearing, leading to a “bull’s-eye” appearance. This classic initial rash is called “erythema migrans” (formerly called erythema chronicum migrans). Patients often can’t recall the tick bite (the ticks can be as small as the periods in this paragraph). Also, they may not have the identifying rash to signal the doctor. More than one in four patients never even develop a rash. The redness of the skin is often accompanied by generalized fatigue, muscle and joint stiffness, swollen lymph nodes (“swollen glands”), and headache, resembling symptoms of a virus infection. The redness resolves, without treatment, in about a month. Weeks to months after the initial redness of the skin the bacteria and their effects spread throughout the body. Subsequently, disease in the joints, heart, and nervous system can occur. The later phases of Lyme disease can affect the heart, causing inflammation of the heart muscle. This can result in abnormal heart rhythms and heart failure. The nervous system can develop facial muscle paralysis (Bell’s palsy), abnormal sensation due to disease of peripheral nerves (peripheral neuropathy), meningitis, and confusion. Arthritis, or inflammation in the joints, begins with swelling, stiffness, and pain. Usually, only one or a few joints become affected, most commonly the knees. The arthritis of Lyme disease can look like many other types of inflammatory arthritis and can become chronic. How to protect yourself from Lyme disease ? To help protect oneself and loved ones, check the entire body regularly for ticks. Do the same with pets. If you find one, remove it carefully and bring it immediately to your local emergency room or urgent care facility for testing. Keep it alive if possible (they may be confined in small containers such as baby food jars or film canisters). Do not use tweezers or squeeze the tick when removing it, and be sure to get to a doctor as quickly as possible. The faster a bite is attended to, the less likely the disease is to become a problem. Wear long trousers and socks, and be sure to check your body every time you go outside. Ticks are not restricted to rural areas, and may be found on long grass, bushes and other plants in towns and subdivisions, as well as on pets or hidden in clothing. Next: NASA and SpaceX To Launch First Private Space Station!